Land Destroyer: Why is a Hong Kong "Activist" in Bangkok? Why is a Hong Kong "Activist" in Bangkok? Joshua Wong's arrest at a Bangkok airport is portrayed as a slight against "democracy," yet the US-funded and backed agitator undermines his own principles of "self-determination" by meddling in another nation's politics. 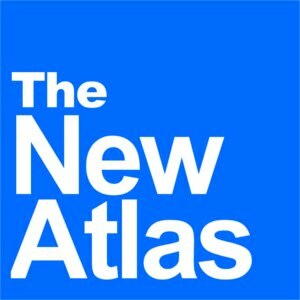 What Thai PBS fails to mention is that Joshua Wong and his party, "Demosisto," are US-funded and directed, and represent Western interests attempting to subvert Chinese control over its own territory of Hong Kong, as well as undermine national sovereignty across the entire Asian region. 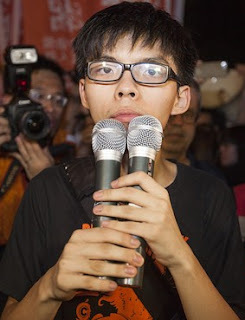 Indeed, the entire "Occupy Central" movement, also referred to as the "Umbrella Revolution," was led by US-backed opposition figures, including Joshua Wong, Benny Tai and Martin Lee, the latter of which was literally in Washington D.C. lobbying for backing just months before the 2014 protest began. While the US State Department's National Endowment for Democracy (NED) initially denied it provided any assistance to the movement and denied specifically that Martin Lee served any role in leading the protests despite his Washington visit, NED through its subsidiary Freedom House, would eventually invite Wong, Tai and Lee back to Washington afterwards to award them for role in leading the protests. 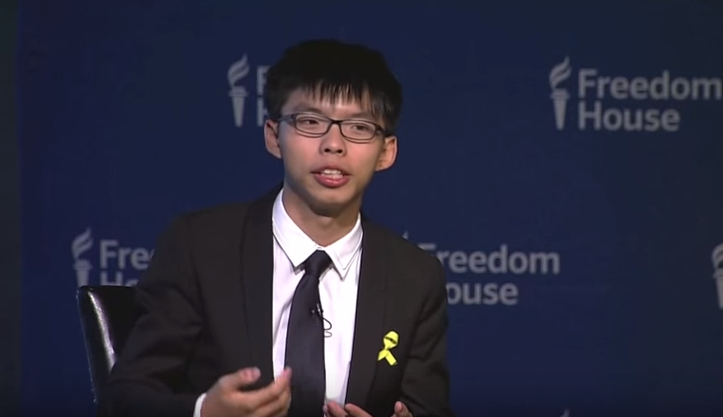 Joshua Wong in Washington D.C. attending a US State Department award ceremony held in his and other US-backed agitators' honour. At the award ceremony titled, "Three Hong Kong Heroes," Lee would shuffle onto stage with an umbrella prop in hand, a virtual admission to his leadership role in the protests and confirmation that NED's previous statement was intentionally false. Wong's political party, Demosisto, headed by Nathan Lee, is also tied directly to the US State Department's NED. 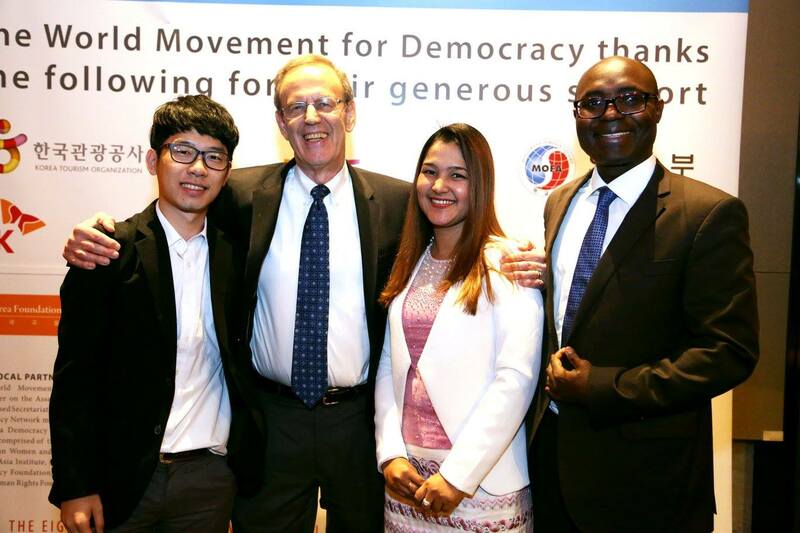 Nathan Law (left) with Carl Gershman of the US State Department's National Endowment for Democracy (NED). The ceremony was yet another in a long line of post-Occupy Central award ceremonies the US State Department conducted, rewarding its proxies for their efforts in the streets of Hong Kong in 2014. In 2015, Malaysia too would confront Wong and his attempts to spread US-backed subversion across Asia. It is also worth noting that after Wong was denied entry, US-funded organisations posing as nongovernmental organisations (NGOs) immediately took to social media in an attempt to criticise the Malaysian government's decision. "Malaysia... explain why he is sent back to Hong Kong? Afraid of more street protests," tweeted Bersih 2.0 chairman Maria Chin Abdullah. Bersih, like Joshua Wong's Demosisto, is openly funded by the US State Department and represents Washington's, not the people of Malaysia's interests. Bersih would be revealed in 2011 to have received funding and training from the US State Department via the National Democratic Institute (NDI), another NED subsidiary. It is perhaps ironic that Wong himself and his supporters portray him as a "democracy activist," considering that one of the central principles of democracy is the concept of self-determination. Self-determination means that a nation's people themselves determine what course of action is in their best interests, free from the influence of foreign interests. The concept of self-determination underpins the national identity of many nations across Southeast Asia, having had their respective national destinies dictated to them at various points throughout their history by European colonialism. Independence and self-determination across the region represent hard-fought achievements threatened by US-backed political fronts wielding "soft power" in place of the overt "gunboat diplomacy" practised by the British Empire in days past. 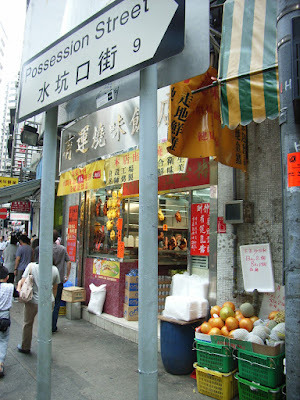 "Possession Street, a relic of Hong Kong's colonial past. Worse than mere foreign backing, Wong and his Demosisto political party work ceaselessly to promote the parting demands made by British colonial administrators as Hong Kong was returned to China in 1997. These demands, including upholding the "one country, two systems" and "Basic Law" drafted just ahead of the British handover of Hong Kong, are echoed by the current governments of both the United States and the United Kingdom. Thus, Wong and his political party, Demosisto, work contra to Hong Kong's self-determination, promoting the parting policy of the British Empire imposed on a still emerging China in 1997. By Wong meddling in the internal affairs of neighbouring Asian states, attempting to bolster US State Department efforts elsewhere to create proxy political fronts to serve Washington rather than local interests, he is also trampling the concept of regional self-determination, and thus of democracy itself. In Thailand specifically, Wong sought to support anti-government agitators likewise seeking to subvert Thai sovereignty and return to power political parties loyal to Washington. Wong's admirers find among themselves a common denominator of affinity toward the United States and American politics. They believe themselves to be enlightened supporters of freedom, democracy and human rights, despite the reality of US foreign and domestic policy standing firmly against all three of these basic and essential principles. From the invasion and occupation of foreign nations around the globe, to the detainment and torturing of people worldwide, to the violence and brutality American police deploy against the American population at home, to the invasive abuse of the American people's right to privacy, American politics in reality exist separately from the ideals cadres of indoctrinated foreigners have been led into believing the US stands for. Wong and his Demosisto political party and other US-backed political fronts like them, represent a danger to freedom, democracy and human rights, serving as a facade behind which US special interests hide their true, self-serving agenda and all of the abuse that surrounds it. By serving as a facade for foreign interests, merely posing as a proponent of democracy and self-determination, it is Wong and those like him that truly endanger democracy's future in Asia, not those awaiting him at airports, turning him and his US-backed agitation away.